Today this blog turns five. Five! That’s half a decade, sixty months, one thousand eight hundred and twenty-five days. Whichever way you put it, that’s a long time. In some ways, it’s passed in the blink of an eye. In others, it feels like a lifetime. What’s perhaps most telling is that I have a hard time remembering what life was like before. What did I do with myself before blogging? I remember clearly the day I wrote my first post. I had woken up in the morning with the idea to start my own food blog, and by day’s end I had a host, a site, and my first post was up. It was a completely impulsive act, and one I made with little regard for the enormous responsibility I might be saddling myself with. In retrospect, that was probably a good thing! Kind of like what I hear about parenting, it was probably better that I didn’t know what I was in for. Then again, if I had known in just how many ways having this blog would end up shaping my life – the new friends it would bring, the confidence it would give me that I had something valuable to say, and most incredible of all, the springboard it would provide for a establishing a career doing the one thing I’ve always most wanted to do, namely talk about food – I would have signed up even quicker. Keeping this blog has also given me the unique experience of chronicling five years of my life. Of course it’s a very subject-specific chronicle, but it’s really surprising to see how much of my life can be relived through the prism of food: the slog through the final two years of my PhD, trying to stay sane in a country without summers (sorry Scotland! ), birthdays and holidays and poignant visits home, the excitement and uncertainty of two international moves, and of course all my travels, many of which I would probably have experienced in a completely different way if I didn’t plan to share them right here. Like many people, I’ve discovered that blogging does much more than provide a platform to record experiences, it actually affects how those experiences are made. I, for one, have found blogging to make me more reflective and deliberate in my actions, and it’s greatly heightened my sense of esthetics as I become ever more aware of the beauty, texture, color and patina in the world around me. Of course I could speculate now on what the next five years may bring, but since things never seem to go to plan anyway, I’ll just consider myself lucky if they’re half as fulfilling as the last five. I can tell you, though, that I’ve got a few things up my sleeve for the coming months, including some exciting long-haul travel on the horizon and a series I’m planning to run showcasing some of the fabulous food blogs I’ve been turning to for glimpses into kitchens around the world. But enough with the philosophizing – it is a birthday after all, and you deserve some cake! Even though it’s not a typical birthday cake, I thought I’d take the opportunity to introduce you a cake that hails from my new home. As you may already know, Germans have a thriving cake culture which revolves around the tradition of Kaffee und Kuchen, or afternoon coffee and cake. On weekends in particular, people will get together with friends and neighbors for some gossip and a slice of something sweet; some people bake their own cakes, but just as many stop by their local bakery for a slice of this and a slice of that. What took me a while to catch on to is that Germans actually never eat cake for dessert – it’s strictly an afternoon thing. But don’t think that means they lack for variety! Even a small bakery will have more than a dozen options, from a simple fruit-topped sheet cake to elaborate layered confections of chocolate, cream and nuts. As much as I love all the chocolate, cream and nuts, though, I also have a thing for simple buttery cakes that don’t call too much attention to themselves. In particular, I have a thing for this Zuckerkuchen, and its quiet yet beguiling charms. I’m told this is not a typical Zuckerkuchen (sugar cake) of the type you’ll find elsewhere in Germany, but a version specific to the region around our home city of Göttingen (roughly from Kassel in the south to Hannover in the north). 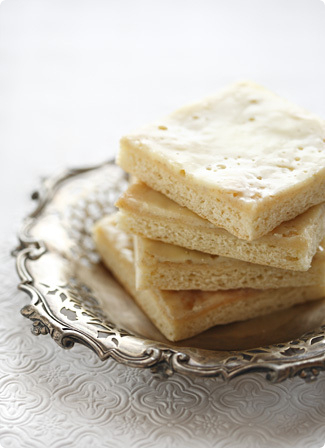 Like other cakes of the same name it consists of a yeasted base – the foundation for many types of Blechkuchen, or sheet cakes – topped with a mixture of sugar and butter that lightly caramelizes in the oven. What makes this one different, though, is the thin layer of sour cream – or Schmand, as it’s called here – painted on the top for the last few minutes of baking. It’s not enough to weigh the cake down but it is enough to give it some moisture and a subtle tangy freshness. I should warn you, though, that it also makes all that butter, sugar and yeast dangerously easy to eat, which shouldn’t be a problem if you just make sure you don’t inadvertently find yourself alone in the kitchen with it after foolishly skipping lunch. I’m telling you, those aromas do wonky things to your self-control. Before I leave you to the recipe, though (and wander back into the kitchen to see if the remaining slices are feeling lonely), I do need to say one last thing that can never be said enough: thank you. Without you, dear readers and commenters and emailers and fellow bloggers, and this wonderful community you’ve helped create, I most certainly wouldn’t still be doing this five years later. For that, you deserve all the cake in the world. Before you see the word ‘yeast’ and run away in fear, don’t. The dough for this cake is not hard to make, I promise. The kneading is minimal and can even be done right in the bowl, and I’ve both under- and over-shot the rising times to no apparent harm. Okay? Okay. Now, for the topping you should feel free to use whatever soured cream product you prefer, but I will say that when given the choice I prefer crème fraîche for its rich, tangy flavor. Whatever you use, though, should you find it not quite tangy enough (and tangy what we’re aiming for here), things could certainly be certainly be improved with a few drops of lemon juice. As for this cake’s keeping abilities, like most yeasted things it’s best the day it’s made. On days two and three you can revive it to nearly its former glory by heating it gently in the oven, covered with foil so it doesn’t dry out. Freeze whatever you won’t be able to eat within three days. In a large bowl, stir together the flour, yeast, salt and sugar. Either in a pan on the stove or in a bowl in the microwave, melt the butter. Whisk the milk, then the egg and vanilla extract into the hot butter. The mixture should now be lukewarm. Pour this mixture over the flour and stir until a shaggy dough forms. Knead the dough, in the bowl, until it becomes soft, supple and smooth – about 5 minutes. If it seems stiff and dry, add additional milk, one tablespoon at a time, until it kneads easily without fighting back. If it’s too sticky to knead, let it sit for five minutes, then try kneading again with clean hands; if it’s still sticky add additional flour a tablespoon at a time. Form the dough into a ball, cover the bowl with a cloth and let rise until nearly doubled in volume, about 45 minutes to an hour. Remove the dough from the bowl and place on a piece of baking parchment the same size as your baking sheet. Using a lightly greased rolling pin, roll out the dough to a roughly 11×15-inch (28×38-cm) rectangle. You can use your fingers to stretch and pat it into shape. It should be about 1/4-inch (2/3-cm) thick. Carefully transfer the paper containing the dough to your baking sheet. For the topping, cover the surface of the dough with thin shavings of cold butter. Evenly sprinkle the sugar over the top. Let rise in a warmish place until puffy, about 30-45 minutes. About fifteen minutes before baking, preheat your oven to 350F/175C. Bake the cake on the middle rack for about 20-25 minutes, or until golden on top. Remove from the oven and immediately dollop the cream over the surface. Using the back of a spoon, spread it around as evenly as possible (it will melt – that’s ok). Return the cake to the oven and bake for a further 7-10 minutes, until the cream has set and looks translucent in places. Congrats on 5 years! Wow! Your cake sounds divine and keep the treats coming for another 5 years, please! A very happy blog birthday to you. That’s my kind of birthday cake. Congrats on 5 great years! It’s amazing how much ground you’ve covered in that time. I had just returned from my first trip to Scotland when I found your blog and became an instant fan. Your beautiful and poetic writing (and your gorgeous food) keeps me coming back. Congratulations Melissa! I am one of the many people who is thankful for your blog. happy blog birthday, here’s to many more delicious posts! Thank you VERY much for your blog! I first came upon I-know-not-how, and found the Brazilian Cheese Bread, and that recipe has been SUCH a blessing, to many people, but then I lost the bookmark more than once, and found it again more than once. And now I hope I never lose you again. This kind of cake is just the best, I think, and I will definitely make it. Congratulations on this big milestone. Congratulations and many more to come!This cake reminds me of the Italian ciambella a simple byt yummy homestyle concoction to enjoy with some tea any day. Great. Congrats! What a great milestone. Congratulations on your fifth year! Isabella can sing ‘Happy Birthday/Feliz Cumplianos’ song just for you. Happy Blogday! Yours is one of those I read from beginning to end when I found it. I love everything about it – stories, recipes, photos. Thanks very much for all your work. Wow 5 years! You must have been one of the first food blogs around. Keep up the delicious work! Happy blogoversary! I look forward to the new series and to trying this cake – I live in Austria and there are so many great recipes I want to try, how to decide…? Congratulations on your blog. Enjoyed your recipe post as well. Thanks for sharing this recipe! It’s really quite risky for me to make bread since I really don’t know anything about the yeast and all of that stuff. But thanks for sharing this recipe! Thank you, Melissa. When I found your blog, I was keeping up with about a dozen food blogs. I have whittled it down to just you. I love your writing, and your recipes are always good. Your blog is inspiring and down to earth. Also, thank you for the cake recipe. I am just now making my foray into yeasted things and will be trying this. Happy anniversary. Just went back and re-read your first post. What a great way to kick off what is still to me one of the best blogs of any kind on the Web. Congrats and hope to see you some time this year! Wish you and your lovely blog many happy returns of the day!I’m sure you’ll have more such 5 years writing your beautiful blog.II’m totally in love with the recipes you have and am following you.Thanks for the pleasant read! Congratulations! It’s been fun reading along . . . Happy blog birthday, Melissa! I still remember our conversations at work about you starting up the blog, and I can’t imagine living without the recipes I’ve got from it that have now become staples in my repertoire. Here’s to another 5 years!Oh, and you are so right about Scotland’s lack of summers. It was snowing here yesterday! Happy anniversary from me as well. I have had you on my blogroll from the first days of mine. Since I spent great parts of my childhood holidays in the Göttingen area at my uncle’s house – in a little village named Bovenden – and mainly because my uncle was a baker I learned to love this extremely tasty cake. My mother is still making it once in a while.So I am very glad to come over someone who shares the same taste.Maybe you know this area’s "Schokoladenkuchen" (chocolate cake), which is also made with a yeast dough, covered with a vanilla pudding and topped with chocolate.This was my very favourite. Ever. Congratulations, Melissa!Can’t wait to read about the long-haul travel…In the words of the late, great Henry Gibson: "keep a-goin’!" Wow, happy 5! and here’s to the next 5. I too am a fan of cakes that are nice and simple and don’t draw attention to themselves. This looks like just the thing to mix together at the cabin, where there are minimal ingredients. Thank you! Congrats on five years!Your photos are gorgeous. I’m curious what lens you use, and what camera also. How do you post process them? They have this lovely feel to them. Do you use a prime lens? Congratulations, 5 years is certainly very impressive. As a fellow American expat living in Germany (also married to a German who takes his Kaffee und Küchen very seriously!) I can recommend Cafe im Liebighaus if you are ever in the Frankfurt area. It’s a small cafe located in the sculpture museum which has very tasty, though very simple cakes. It’s our favorite! Congratulations on this very important anniversary! This site never fails to give me joy and inspiration. Thank you, and many happy returns! I don’t think I’ve ever commented, but I adore your blog and I think I’ve been reading it on and off for the entire five years. Favorite receipt of yours: pumpkin rum coconut soup. The first time I made it, I spent all day on the prep and then at the final stage, where I moved it from blender back to pot, the bottom of my blender fell out and your gorgeous soup went all over the floor. Since then, it’s gone much better! We even bought two new blenders (one stick, one upright) for safe soup-making. I’m making it today, on a rainy Sunday afternoon in the San Francisco Bay Area when the Giants are rained out and so is my garden. Wow, congrats on the anniversary. First time to your blog – I like it! I made this cake and it is delicious! I had left-overs for breakfst with strawberries and yogurt. Heaven!I love your blog and have made several of the recipes here. I think they are all my favorites. I make the Eggnog recipe (alocohol-free) year round – every day is a holiday!